In 2014, the Peace Advocate’s delegation traveled to the Philippines, gave lectures in many universities, and even held a Peace Walk with the university students. The population of the Philippines is about 120 million, and the cardinal of this country is the same age as peace advocate Man Hee Lee is. So every time peace advocate Man Hee Lee visits, he has a meal together and chat at the Catholic theological seminary, and this cardinal has also signed the peace agreement. 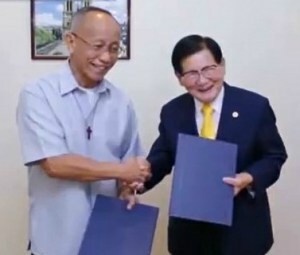 It was September, 2013, Chairman Man Hee Lee of HWPL and peace delegation were staying at a hotel in Manila, the capital of the Philippines. One day, a Catholic archbishop of the Mindanao Island came to visit Man Hee Lee at the hotel and asked him to cease the religious conflict on the Mindanao Island.